Today, we look at the true meaning of Christmas, by which I mean child-eating monsters. Krampus has become mainstream, but I only just learned about some of the ones from Iceland. There, the Yule season involves trolls, and not Treasure Trolls, but giant, ravenous ogres. There’s also an enormous fashion-obsessed cat, but I’m getting a little ahead of myself. I’m going to start with the giantess Gryla, who lives in a cave in the Dimmuborgir lava fields and eats bad children. She’s described as having hooves, horns, and up to fifteen tails. It was apparently traditional to dress up as her, although she wasn’t really associated with Yuletide until the seventeenth century. Now, she’s specifically said to capture kids who are naughty at that time of year and make stew out of them. She has had a total of seventy-two children with three husbands: Gustur, Boli, and Leppaludi. She ate the first and murdered the second, but seems to still be married to the third. 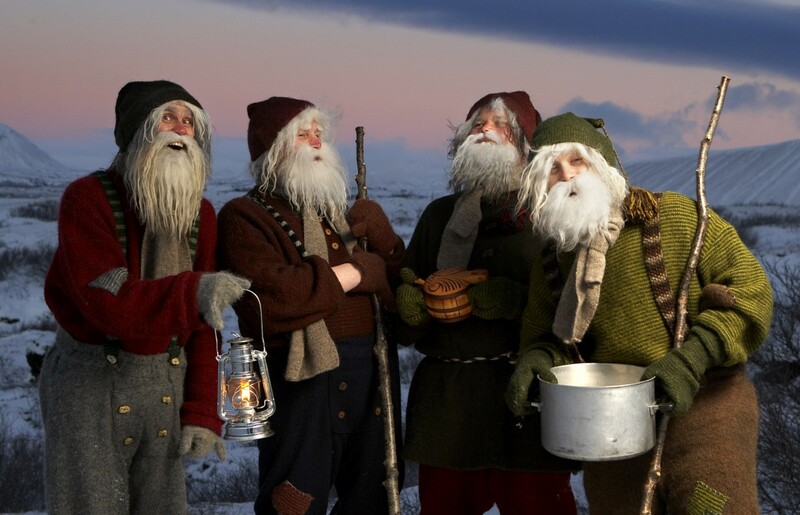 They have at least thirteen children together, and these thirteen are the Yule Lads, who show up before Christmas to wreak havoc in various ways. The number is not always consistent in older sources, but it’s generally thirteen today, one arriving on each of the thirteen days before Christmas and going back home thirteen days after showing up. That means the first one comes out tonight, so watch your sheep, because that’s what he eats. He has peg legs, though, which can make it difficult from him to obtain his prey. He’ll be gone on Christmas Day, and the last one leaves on Epiphany. They all have very descriptive names, the first one being Sheep-Cote Clod, followed by Gully Gawk, Stubby, Spoon-Licker, Pot-Scraper, Bowl-Licker, Door-Slammer, Skyr-Gobbler, Sausage-Swiper, Window-Peeper, Doorway-Sniffer, Meat-Hook, and Candle-Stealer. Of the ones that might not be as obvious, Gully Gawk hides in gullies until he can sneak into cowsheds and steal milk, Stubby eats the crust from pans, skyr is made of cheese curd, and Doorway-Sniffer favors flatbread. As Candle-Stealer eats the candles, which are made of animal fat, it seems that Door-Slammer is the only one not motivated by hunger, although it’s not entirely clear whether the things Window-Peeper steals are edible. It’s said that Gryla never wants for children to eat, but is she not sharing with her own kids? Maybe they just don’t care for human flesh. Anyway, the Yule Lads have been somewhat tamed as of late, distributing presents instead of (or as well as) tormenting people. So while we only get one guy delivering gifts for much of the world, Iceland has thirteen. Well, it’s important to keep trolls employed. 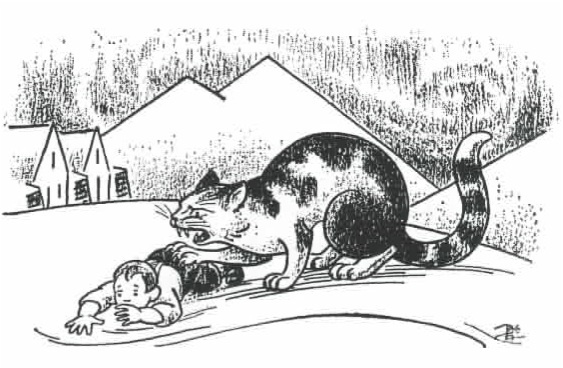 Finally, we get to the Yule Cat, or Jalokotturinn, a pet of Gryla and the Lads. While the giant feline is thought to be a traditional figure, the first written mentions of it only date back to the nineteenth century. If you have new clothes for Christmas, the cat will leave you alone. Otherwise, it will straight-up eat you. The threat was that children wouldn’t receive clothes if they didn’t do their chores, which would leave them to be cat food. I think it might just be a ploy to stop kids from complaining when they clothes as presents. This legend also encourages people to give to the less fortunate, as that means fewer victims for the cat. I’m not sure why a cat would care so much about clothes, but that’s how they roll in Iceland. A lot of what we know about these holiday monsters, particularly the connections between them, comes from a 1932 work by the poet Johannes ur Kotlum called Jolin Koma, or Christmas Is Coming. That title sounds like it might be more of a threat than a promise to Icelandic children. Here’s a recording of Björk singing the poem about the Yule Cat. This entry was posted in Animals, Christmas, Holidays, Monsters, Music, Mythology, Norse, Poetry and tagged bjork, boli, cats, christmas is coming, giants, gryla, gustur, iceland, jalokotturinn, johannes ur kotlum, jolin koma, leppaldui, santa claus, trolls, yule, yule cat, yule lads. Bookmark the permalink.